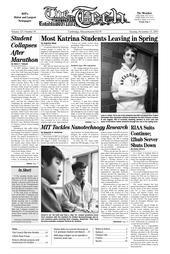 CORRECTION TO THIS ARTICLE: A front-page article Tuesday about MIT graduate student Annette M. Hynes, who was hospitalized after running the New York City marathon misstated Hynes’ condition. She walked to the emergency room after the race; she did not collapse. She spent a night in the emergency room because beds on the regular floor were not available; she was never in intensive care. She is receiving dialysis three times a week, not three times a day. An MIT graduate student has been recovering from kidney failure at the New York University Hospital after completing the New York Marathon on November 6. Annette M. Hynes G is receiving dialysis three times a day, said her sister, Lynnette Hynes. She is still nauseous and does not eat much, but takes walks around her hospital room, Lynnette M. Hynes said. Complete recovery typically takes one to two months, but it is not known whether Annette’s kidneys will sustain permanent damage, she said. Marathoners who suffer kidney failure usually do not sustain permanent damage, but Annette’s condition does not fit the typical marathoner’s profile. The muscle breakdown level and red blood cell count in her bloodstream were below the levels that usually cause kidney failure in marathoners, Lynnette Hynes said. Doctors are looking for possible pre-existing conditions that may have resulted in the kidney failure. Lehman said Annette also has hypovolemia and hyperemia, respectively an abnormal decrease in the volume of circulating blood, and an excess of blood in a body part or organ. Annette began running cross-country in high school and has enjoyed it since, her sister said. This was her first marathon, though she has run half-marathons before. Senior Scientist Scott C. Doney PhD ’91, Annette’s supervisor at the Woods Hole Oceanographic Institute, said that she has completed several adventure races, such as a “Reach the Beach” race in New Hampshire. She trained for the New York Marathon for the full recommended four months, gradually increasing her distances and peaking at 20 miles, Lynnette Hynes said. A native of Nebraska, Annette obtained a triple major in mathematics, biology, and education from the University of Nebraska-Lincoln. After working with the Peace Corps in a rural school in Kenya for three years, she came to MIT to study marine biology. Doney said that Annette is researching phosphorus limitations and stress in a nitrogen-fixing marine cyanobacteria and plans to focus future research on competition and environmental factors affecting these cyanobacteria.